Literally ‘al doende leert men’ translates as ‘while (busy) doing one learns’. In general you can use a similar construction when describing an activity that takes place during another, e.g. ‘al lopende telefoneerde hij’, however it is not very common and more often you will see ‘hij telefoneerde lopend’ (‘he phoned (/ was using his phone) while walking’). – Ervaring: experience [noun] [de ervaring, de ervaringen]. – Leren: to learn [verb] [leerde, geleerd]. – Doen: to do [verb] [deed, gedaan]. This entry was posted in Dutch phrase of the week, DWOTD 1.0, Vocabulary Intermediate and tagged al doende leert men, doen, ervaring, leren by Sander. Bookmark the permalink. A bit off-topic, but for anyone who is worried, or has suffered from this disaster (as I have!) I found this free, private, reliable and secure online backup that may help fellow DWOTDers. It’s saved my bacon a few times. dank u, ik heb zo veel geleerd van uw blog. I would offer “one lives and learns” as a translation of today’s phrase. 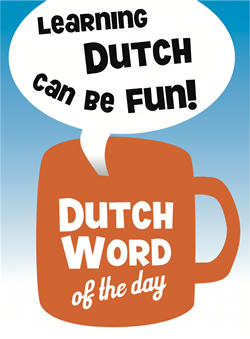 How common is the phrase in Dutch? I don’t remember coming across it, but that could be just because I didn’t recognise it and haven’t, therefore, remembered it. Hi Alastair, I will add the translation, thanks. For the reasons above I put it in the category ‘Intermediate’.